I’ve found out about a very nice Polish food blog event recently. The event was called Cytrusowy Weekend (Citrus Weekend) and was hosted by Tatter from Palce lizać blog. It’s the first challenge I've been taking part in, so I’ve been quite excited about it. I spent hours searching for recipes with citrus fruit and I was actually surprised how many delicious things you can make with it. 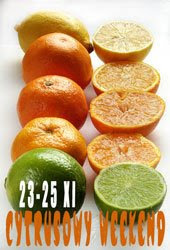 I’ll be certainly using more citrus fruit in my cooking from now on. Now when the days are cold and cloudy I really miss summer days. That’s probably why the recipe for Sunshine Tart was the one that most appealed to me. The recipe was adapted from a special edition of Polish Naj magazine, the issue from March 2000. The original recipe called for orange liquor, but since I didn’t have any at home, I used brandy instead and it worked fine too. 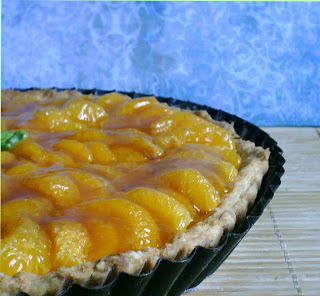 I also increased the amount of mandarin oranges as the amount used in the recipe wasn’t enough to fill the whole tart. The recipe called for different amounts of sugar twice which was probably a mistake, I added only the first 5 spoons and didn’t use the remaining 7 spoons for which the recipe asked. The tart would have been a way too sweet with 7 spoons of sugar more. I also placed the glaze on the mandarins, not under as the recipe said. Sift the flour into a large bowl. Using your fingertips, rub the margarine into the flour until the mixture resembles coarse breadcrumbs. Add salt, egg, sugar, and orange zest and knead the dough with your hands to form a ball. Wrap in plastic wrap and refrigerate for one hour. Lightly grease 25 cm (10 inch) tart pan, then line with the pastry. Prick all over with a fork. Bake for 25-30 minutes. Remove from the oven and leave to cool. Arrange the mandarin oranges over the crust. Heat the apricot jam and the orange liquor (or brandy) in a small saucepan until melted. Remove from the heat and strain the jam through a strainer to remove any fruit lumps. Let cool until slightly warm. 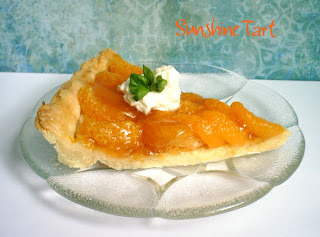 Brush the tart with the glaze. Decorate with mint leaves. Komarka: Cieszę się, że Ci się podoba!!! Tatter: Thank you for organizing the event, it was a wonderful idea to cook something with citrus fruit at this time of the year!! !